Sciblogs | Ozone hole 25 years on – signs of recovery? 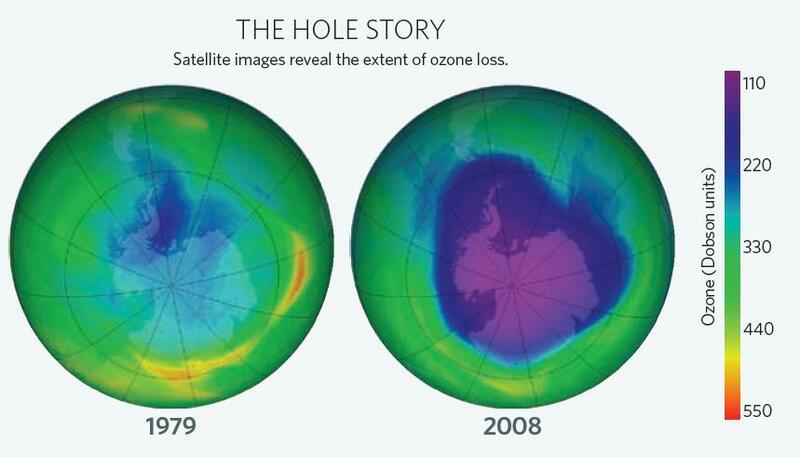 Ozone hole 25 years on – signs of recovery? The journal Nature this week features a very interesting article from Jonathan Shanklin, head of the Meteorology and Ozone Monitoring Unit at the British Antarctic Survey and one of the three scientists who discovered the hole in the ozone layer 25 years ago. The prevailing expectation at the time was that chlorine from CFCs would affect the ozone layer by photocatalytic decomposition, and that these effects would be most marked high in the tropical stratosphere. No one was searching for long-term patterns in springtime data for the Antarctic. But I did not know any of this. In preparing for an open day at the British Antarctic Survey Shanklin and the other scientists put together some data which was designed to reassure the public that CFCs from spray cans and “exhaust gases from Concorde flighs” weren’t eating away the ozone layer. But on putting the data together to form a graph they found that “springtime values [for ozone] did look lower from one year to the next”. This hadn’t been picked up before because the BAS had a huge backlog of data yet to be processed. As I remember it, there was no real eureka moment in the discovery, more a combination of pieces falling into place. Comments from observers at our Antarctic stations suggested that on occasion they saw unusually low ozone values in the spring. The graphs compiled for the open day weren’t in themselves convincing, because the prevailing theory suggested that springtime values were highly variable and dependent on short-term weather conditions. What convinced the team was a graph plotting the minimum 11-day mean, which clearly showed that the spring decline was systematic. Subsequently, and armed with the science, the nations of the world came up with the Montreal Protocol in 1987 which mandated the phase-out of CFCs, which were replaced by less-harmful gases. How’s the ozone hole looking now? The cooperative pact proved to be successful, ozone depletion stabilised, something which New Zealanders in particular can appreciate as located in the region of the hole we were and still are harshly treated by the lack of relatively lower level of protection from UV rays. But have things improved to the extent that the damage to the ozone layer is starting to be undone. National Institute of Water and Atmospheric Research’s (NIWA) scientist Richard Mackenzie, who measures ozone levels from NIWA Lauder was quoted on Radio New Zealand this morning as saying that the recovery may have started already. Some researchers have begun to say that they see a recovery, but I believe that this is premature, particularly as there have been no major volcanic eruptions during this period (sulphur dioxide from the recent Icelandic eruption hasn’t reached up high enough to affect the ozone layer). Assuming that all of the restrictions of the Montreal Protocol are followed, Antarctic springtime ozone levels are expected to return to those first measured in the 1950s by 2080. The public was keen to see action [on CFCs]: the evidence was strong and clear; the hole sounded threatening; and there was a link between thinning ozone and cancer. And the public did not feel bullied or threatened – no one was telling them to radically change their way of life. There was a problem, and something could be done about it. By contrast, the evidence for man-made climate change is less clear-cut to the average person. And people are given the impression that civilization will collapse unless they abandon cars and radically change their lives in other difficult ways. Not surprisingly, there is confusion and resistance. By a happy accident, the Montreal Protocol has done more to reduce greenhouse gas emissions than the Kyoto treaty3 – CFCs are potent greenhouse gases.